My dog says this is the tale of Shawnee. 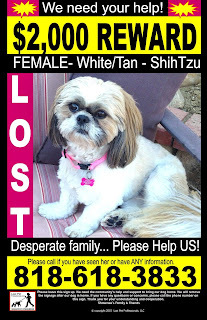 On April 22, Shawnee went missing in Castaic, California. Her family has been looking for her ever since. They have plastered the community with 2,500 fliers and a dozen, eight-foot banners. They contacted every lost pet site and hired a company to make phone calls to all those who live in the surrounding area. They visited neighbors, dog parks, groomers, pet stores, and other local businesses to spread the word. And, they hired a pet detective and scent tracking dogs to find out Shawnee's path. The latter determined that Shawnee slipped out under a fence, went across the backyards of four houses, and the the trail went dead at the street. Shawnee was likely picked up by someone in a car and driven away from her home. Shawnee is microchipped and has an ID tag, so her family expected to hear from someone by now. But, that hasn't happened. 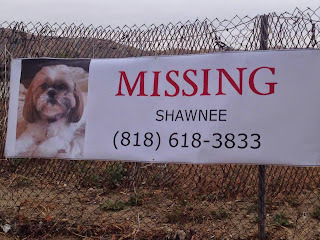 Shawnee is still missing. Her family is devastated. We sat with Shawnee's mom Joyce to learn more about Shawnee and how people can help bring her home. 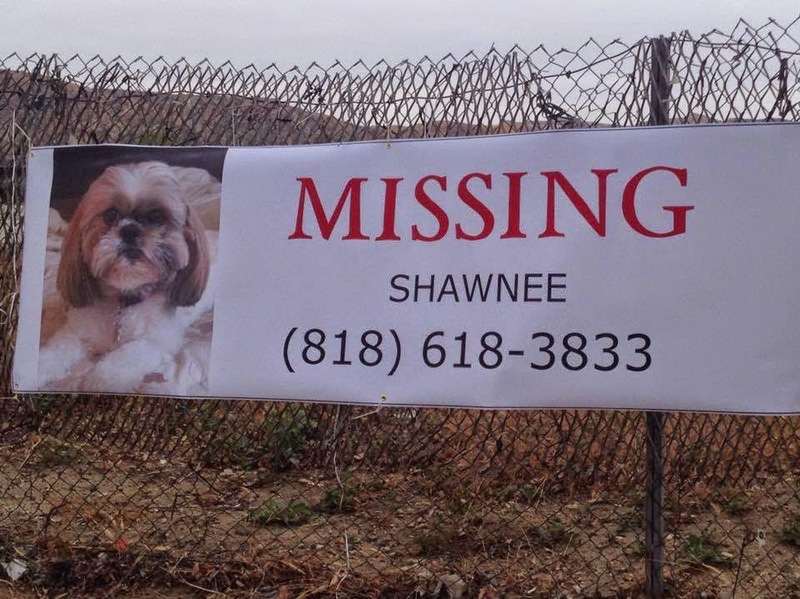 My Dog Says Woof: If someone knows of Shawnee's whereabouts, what do you want to tell them? Joyce: We would like them to know how much we love our Shawnee and that there's a huge hole in our hearts with her being gone. We beg them to contact us and share whatever they know. 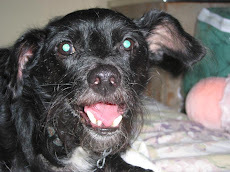 My Dog Says Woof: What would getting Shawnee back mean to you? Joyce: Getting Shawnee back would mean our family is whole again. We don't have children, Shawnee is our little girl. She's not just a pet, she's our baby. She's the kiss that greets us when we get home from work, the first hug when we wake up in the morning, the cuddles on the couch in the evenings. Shawnee is sweet, friendly, and runs up to everyone with trust and love. My Dog Says Woof: Lots of people find dogs, but don't want to take them to the shelter because they're afraid they'll get killed. What should these people know? Joyce: People need to know that shelters are the first place many pet owners look when a beloved pet goes missing. The shelter can scan a dog and identify the owner immediately. If not chipped, the shelter can be a safe place for the dog to wait for the owner to locate them. People have a misconception that shelters just put dogs to sleep. They try to find the owners, and then they try to adopt out lost pets. If someone finds a dog and is worried about it, they can put their name down as having first rights if the owner doesn't claim the dog. I've heard stories of people thinking they're doing the "right thing" by taking found pets to shelters in another area because they're "no-kill" shelters, but this can make it harder for owners to locate their fur babies. My Dog Says Woof: How can someone get Shawnee back to you anonymously, but still collect the $2,000 reward? Joyce: They can contact Shannon Tulloss Investigations at (818) 478-7900. She will treat this with complete confidentiality and has agreed to be a safe and anonymous drop off location for someone who is worried about getting caught or fearful of turning in someone they know. But in all honesty, all we want is our baby back, we have no problem meeting with anyone who can give her back. We'll meet in a public place. Our only goal is to get Shawnee back home where she belongs. 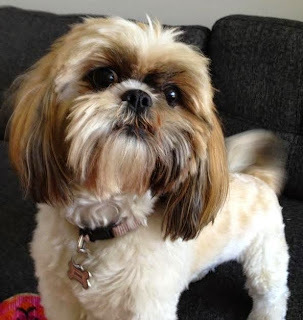 My Dog Says Woof: Do you have any advice for others who have lost dogs? Joyce: We did everything we thought we were supposed to do. Shawnee had a collar on, with identification tags. She is microchipped. We secured our backyard. But small dogs sometimes find a hole in the fence, some room to wiggle under the fence, or escape through a gate that's been left open. We will never give up. We just hope that people, strangers and neighbors, will stay vigilent and watch out for Shawnee. We have worked tirelessly to find her, and we will never give up. There's nothing we won't do! We love her and we want her home, safe in our arms! If you have any information about Shawnee's whereabouts, please contact Joyce at (818) 618-3833 or Shannon Tulloss Investigations at (818) 478-7900. Shawnee's family doesn't care who you are or why you have Shawnee, they only want her back. 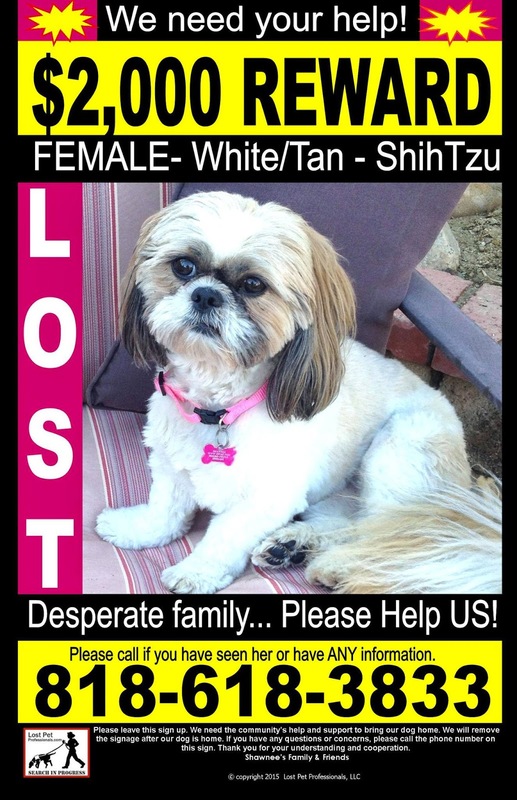 A $2,000 cash reward will be given to anyone who returns her. NO QUESTIONS ASKED. Please, if you have seen Shawnee or know her whereabouts, come forward.